Bhel Gallery | Welcome to Bhel. by Duarte Vitória. Click here for details. Oil on linen 2000 x 1800 mm (78.7 x 70.8 in). 2015. 'The Twin Poisons of Jealousy and Success' by Fergal T. Fitzpatrick. Click here for details. 1000mm x 1000mm (39.3 x 39.3 in). Acrylic and oil on canvas. 2015.
by Lloyd Keane. Click here for details. Each framed image 210 x 297 mm (8.27 × 11.69 in). Pen and ink on paper. 2015 / 16.
by Kaeti Wietzel. Click here for details. 610 x 914 mm (24 x 36 in). Acrylic on Canvas. 2006.
by Ingvild Clark. Click here for details. 500 x 600mm [19.6 x 23.6’’]. Acrylics on MDF board. 2015. 750 x 600 mm (29.5 x 23.6 in). Acrylic on MDF board. 2014.
by Andre Harke. Click here for details. 230 x 310mm [9 x 12in]. Coloured pencils on Arches aquarelle paper. 2014.
by Fergal T. Fitzpatrick. Click here for details. 800 x 1200 mm [31.5x 47.2 in]. Acrylic and Oil on canvas. 2015. 1400 x 1505 mm (55.1 x 59in). Oil on linen. 2015. 1219 x 1524 mm (48 x 60 in). Acrylic on Canvas. 2007.
diptych 1400mm x 700mm (55.1 x 27.5 in). Acrylic and oil on canvas. 2014. 666x666mm [26.2x 26.2in] Acrylic and Oil on canvas. 2016. The Bhel Gallery an artist-run initiative showcasing work from international and European artists. 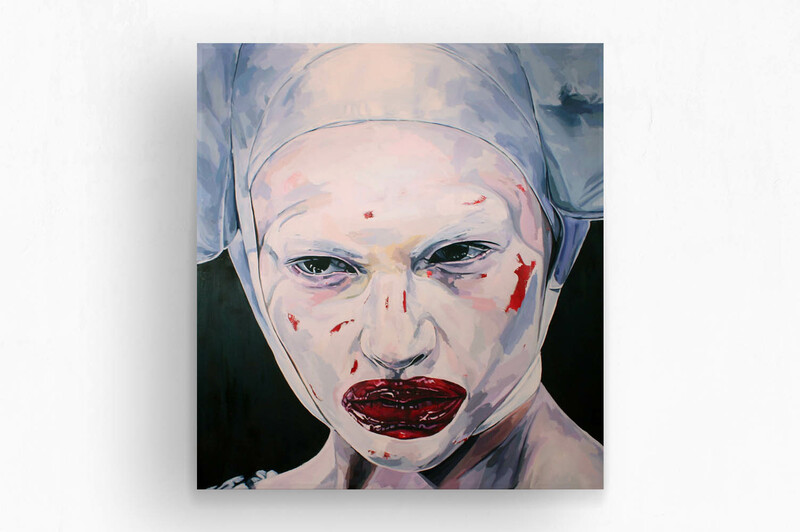 Our online gallery provides an innovative space for contemporary visual art and illustration. 'Ambiguous' by Duarte Vitória. Click here for details. 'Black Horizon Perspective' by Lloyd Keane. Click here for details. 'Pig God' by Kaeti Wietzel. Click here for details. ‘The Hounds of Tindalos’ by Ingvild Clark. Click here for details. 'The Command To Look' by Ingvild Clark. Click here for details. 'From the 4th Angle' [left] and 'From the 5th Angle' [Right] by Andre Harke. Click here for details. 'Blood Inside' by Fergal T. Fitzpatrick. Click here for details. 'Love God Harder From Within the Red' by Fergal T. Fitzpatrick. Click here for details. 'Tear of Blood' by Duarte Vitória. Click here for details. 'The Birth of Creation' by Kaeti Wietzel. Click here for details. 'Witch' [left] and 'The Black Flame' [Right] by Andre Harke. Click here for details. 'Damnation Games' by Fergal T. Fitzpatrick. Click here for details. 'Homo Ludens - Orgonorama' by Fergal T. Fitzpatrick. Click here for details.